This last few months we have just done a lot of testing and waiting, so I haven’t had much to post until this week. Carson had his feeding tube put in on May 5th. Since then he has gained a little over 2 pounds. He has also pulled his tube out 17 times (thank God for nursing school!). His formula has been concentrated so that he is getting the maximum amount of calories per ounce and protein that his body can handle. Because of this he now has an electrolyte imbalance and is on a daily prune juice regimen for constipation. A liver ultrasound showed that his electrolyte imbalance is not having a negative effect on his liver, and he has to get blood work done every few weeks to keep an eye on things. Because of all of the testing he has been stuck over 50 times. Even though he has gained 2 pounds he still has not made it onto the growth chart yet in weight or height (he looks longer than he is). If we were to remove his feeding tube today he would start losing weight again by this time next week. Because of this his feeding tube is being moved. NG tubes are not designed for long term use. His face is beginning to tear from the tape and get pressure sores from the tube. We meet with a surgical team next Monday, the 30th, to schedule him to get his tube moved directly into his stomach (PEG tube). Basically what will happen is he will have an endoscopy, and the surgeon will mark him based on a light that will be pushed up against the wall of his stomach. They will then make a small incision just big enough to slide a tube through. 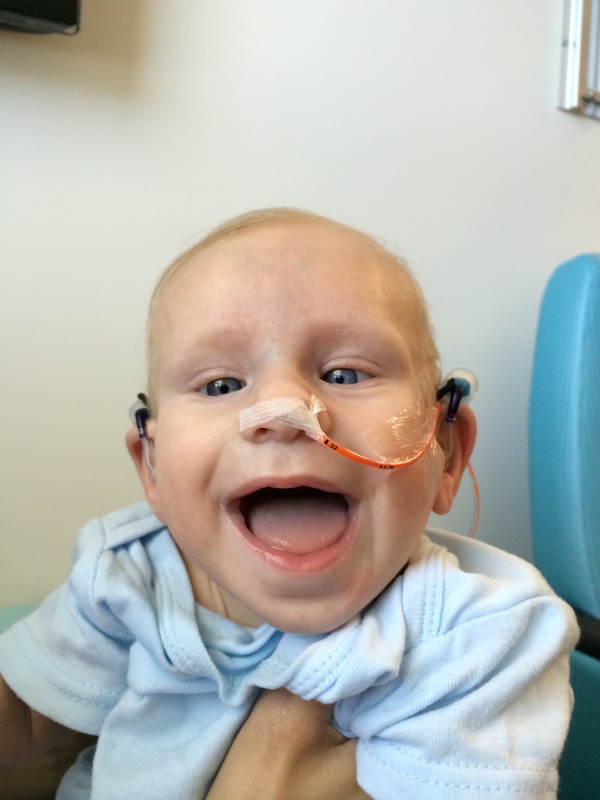 This feeding tube is more long term and he will not be able to pull this one out! 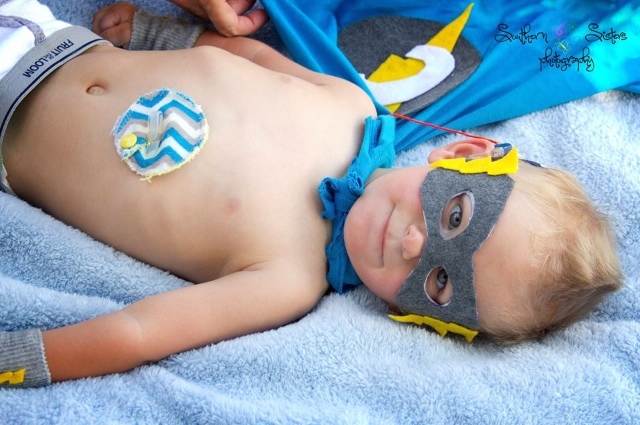 The next surgery that will be scheduled is for his cochlear implants. I was told by his speech therapist this last week that she has put in the referral for him to be evaluated by the implant team. Once he is evaluated we will have several appointments with an audiologist where we go over surgical procedure, product options, and what to expect as far as recovery goes. We will then meet with the surgeon. Carson has already had an MRI done, but if the surgeon requests a CT scan (which he probably will) that will push the procedure back. The surgery itself only takes an hour or so, and we will be able to take Carson home the same day. He will not be able to hear after his surgery. The implants have to be activated and this does not happen until 2-3 weeks after surgery to allow scar tissue to build around the implant. Christian and I would like to have his implants activated on his first birthday, but of course we have no control over the timing of his surgery. We are beyond ready for him to be able to hear, but we don’t like that he will have to have two surgeries within the next few months. I have had people asking me about his genetic testing. When we were in the hospital blood work was taken to test for Cockayne syndrome. Unfortunately we were given an estimate of 2 months before results would come back, so we are still waiting. We are starting to notice things that are making us question that quality of Carson’s eyesight. That is our next issue that we will be addressing. We have noticed that his right eye turns in a lot of times and that he does not seem to be able to see things unless they are pretty close to him. It could just be that since he can’t hear it is harder to get his attention, but we are going to get his eyes checked just to be sure. On a more positive note, there is something that we want everyone to keep in the back of their minds. His birthday is still 4 months away, but of course we are already planning. Instead of having a traditional party where people bring gifts we want resources to be put to better use. November 15th, the weekend after Carson’s first birthday party, there is something called Walk 4 Hearing in Jacksonville. It is a 5K that is in honor of hearing loss awareness. We are creating a team to walk the 5K, and instead of gifts we are asking for donations to Carson’s team. I cannot think of a better gift to give my child, and other children, than the ability to hear. With that being said we are having trouble coming up with a catchy team name. If you can think of one we are open to suggestions! He is a precious little boy and my prayers are there for him and his family. Hard to believe he will be 1 yr old soon. I would be more than happy to donate to the walk in his name. We are still praying for you all. I would love to be a part of the November walk (as long as we’re talking about walking, not running). Praying for little Carson and your family!